It is important to monitor population trends, population distributions, and habitat to ensure sufficient protection for wildlife. Toward this goal, the Environment Agency supports monitoring surveys on threatened species, surveys on designated special birds, satellite tracking of migratory birds, taking census of waterfowl populations, and bird-banding research. In 1990, the Environment Agency started monitoring threatened species (identified as "Endangered" or "Vulnerable" in the Red Data Book of Japan) for population trends, habitats, etc. The Agency organized an advisory committee consisting of 7 members with various areas of taxonomic expertise. In 1990 and 1991, the committee selected the species for future monitoring, considered items to be monitored, identified the monitoring methods, established networks of field researchers at the local level, and conducted preliminary surveys. Since 1992, full surveys have been conducted. The committee will review the results of the monitoring survey each year, and the Environment Agency will conduct urgent and intensive surveys or implement protection and recovery projects for specified species according to the recommendations of the committee. Bird-banding surveys are conducted to determine the status of migratory birds and their ecological systems and to help promote measures to protect birds as part of the continuing effort for international cooperation. Bird-banding surveys were initiated in 1924 but were suspended during World War II. The survey did not resume at full scale until 1961. Japan currently has sixty bird observation stations: ten first-class stations and fifty second-class stations. Over the years, the scale of bird-banding programs has grown significantly. In 1995, a total of 174,455 birds representing 280 species were banded while a total of 1,117 birds representing 68 species were recaptured. The number of banded specimens has grown considerably because of the cooperation of researchers and volunteers who band birds. Forty-one barn swallows that were banded in Japan have been recovered in other countries; thirty-one individuals were recovered in the Philippines. The survey on waterfowl populations has been conducted since 1970 with the assistance of prefectural governments. The survey is carried out annually around January 15. This nationwide survey examines the locations and geographical conditions of the principal wintering sites for goose, duck, and swan species. The survey also identifies these species and tallies the number of geese and swans at all wintering locations and the number of ducks at a maximum number of wintering locations. The results of the survey conducted in January 1996 indicated that 61,027 swans (29,258 Cygnus cygnus (whooper swans) and 31,198 Cygus columbianus (whistling swans)), 37,107 geese (approximately 31,740 Anser albifrons (white-fronted geese) and approximately 4,624 Anser fabalis (bean geese)), and 1,867,150 ducks (469,345 Anas platyrhynchos (mallards) and 216,530 Aythya marila (greater scaups)) wintered in Japan that year. Since 1992, a joint Japan-Russia cooperative research project on the Haliaeetus pelagicus(Steller's Sea-Eagle) has been conducted under the Japan-Russia Migratory Bird Agreement to collect basic data for the protection of the species. To protect migratory birds, it is important to identify migratory routes, species' population distribution, breeding site habitat, and non-breeding site habitat . 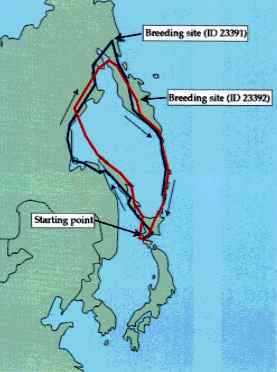 For the satellite tracking research, transmitters were attached to total of fourteen eagles, including a few Haliaeetus albicilla (white-tailed sea-eagle). The research revealed the main migratory route and their diet in winter. The survey was completed in 1996.